There are various good reasons to perform a factory reset: fixing bugs following an Android update, general housekeeping for maintaining Android performance and completely wiping data from your phone. The problem is that Google’s built-in factory reset option can leave your data exposed even after a reset. Here’s why a factory reset doesn’t wipe all your data, and what you can do about it. 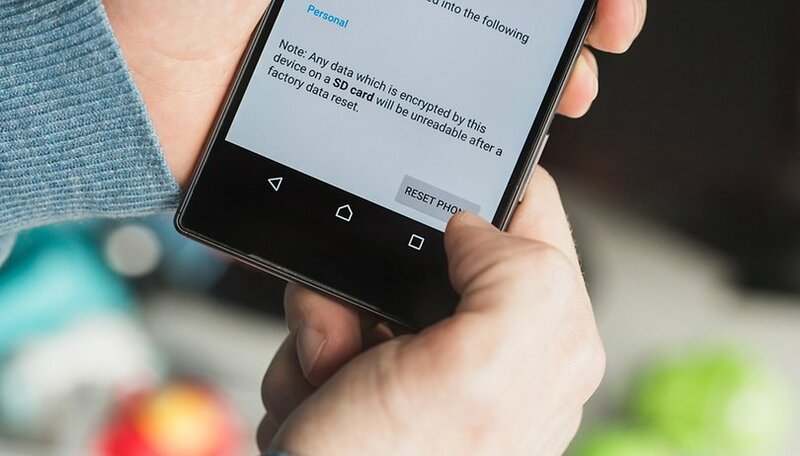 The factory reset problem was uncovered by some Cambridge University researchers in the first major study of this taken-for-granted Android security feature. The factory reset, we’ve always been told, will delete all data, accounts, passwords and content from your Android device. The problem is, this is only partially true. Reset to factory settings: why doesn't it work? The researchers tested a range of second-hand Android devices running Android versions from Android 2.3 to Android 4.3 and found that in all cases they were able to recover account tokens – which are used to authenticate you once a password is entered the first time – from service providers such as Google, Facebook and WhatsApp. In a staggering 80 percent of cases, they were able to recover the master token. The master token is essentially the key to the front door, the equivalent of installing a top-notch security system and then hiding the key under the doormat. Once a master token is recovered, the user’s credential file can be restored and all your data re-synced to the device: that means emails, cloud-stored photos, contacts and calendars. Why is private data recoverable even after a factory reset? There are a few reasons. Part of the blame is with the manufacturers who simply don’t provide the software required to fully wipe flash storage. Likewise, flash storage is notoriously hard to wipe, and of course, Google is to blame for not providing a more fail-safe option for users. The researchers went on to note that while security and antivirus companies may use these findings to promote their own tools and services that the only real solution was likely to come from the vendors themselves. Unfortunately, even devices with built-in encryption are not safe from these weaknesses. The decryption key is also left intact on a device once it has been factory reset. While that key is itself encrypted, gaining access to it would be a few days’ worth of work for most hackers, according to the researchers. It must be noted that devices running Android 4.4 and above were not tested, so it is not clear whether devices running Android Oreo, KitKat and Lollipop are also affected, although the researchers were quick to point out that it’s plausible that they could be. The main things you can do to protect yourself is to encrypt your phone and use a strong, randomly-generated password that contains a mixture of upper- and lower-case letters, numbers and symbols and is at least 11 characters long. The issue with this is that it is sufficiently awkward to do on a regular basis that most users simply won’t do it. Alternatively, once a phone has been factory reset, the flash storage can be refilled with useless data to overwrite the tokens and crypto keys left in flash storage. Of course, the app used to fill the phone would need to be installed outside of Google Play to avoid a Google token being registered on the device once again. The only other solution the researchers came up with was to destroy the device. This solution, however, raises issues for users that find themselves with a lost or stolen device, or for those devices that have been remotely wiped with Android Device Manager. Until a legitimate solution can be found, just be careful who you sell your second-hand phone to. Have you sold a phone in the past? Did you think a factory reset would protect your data? Share your thoughts in the comments. I don't sell my old phones, I'd rather make a phone tech museum(shows me how my phone habit, and knowledge has advanced over the years, hey ya gotta have a mini hobby). From my first phone, a tracfone, that I used as a red cross worker for the Katrina flood, to today, most of my phones are in very good shape(never cracked a screen, busted a sim tray, etc..) No one will ever get my data, that way. No matter how many times I do a factory reset I am still being asked for a password? does anyone have a solution for this? Okay I've done factory reset and my phone is still frozen. Can someone please tell me what is wrong with my phone because it was fine before? Hi Emerald, which phone are you using? Hi, what exactly is happening? Does it constantly reboot? Does it freeze? So assuming someone has deleted images from their phone (obviously I know they aren't totally gone), then ran a factory reset about 15 times, what are the chances of these deleted images being found during a routine repair/system flash? I guess I'm asking whether these just pop back up on the phone straight a way, or whether someone has to set out to specifically look for them, and, if so, how hard do they have to look, would this would form part of a normal repair? I sent my smart platinum 7 off to Vodafone for repair (running android 6. something) and am now having a mild panic attack that pictures of a "personal" nature :) are going to show up,. I ran an off the shelf photo recovery app before I sent it and nothing showed up (the same app found them before I did the re-set), am I likely to be okay or are my pics going to go viral??? At last I'm finally getting a better understanding of the problem I'm having with my smartphone and Android 6! Unfortunately, the article doesn't help me in my current situation: I don't remember the google account details I used to be able to use my phone! I had to do a hard reset but I now can't resync the phone. Can anyone tell me how to totally wipe the google account information from the phone when I'm not in normal use situation? I've been going round in circles on google sites with no success. Then restore the settings again. Otherwise, it is not bad, once every three months to restore data, the phone clears and runs better. but on a more serious note, why cant they even clear out a key for encryption properly? especially since it's so much easier than wiping everything which takes ages and wears off the memory. Heh, why. Is it because dimwits worked on that particular implementation, because the supervisor said "it's good enough", or because it's a design flaw of the (operating) system - the bottom line is that it seems that Google just doesn't care. They couldn't care less, right? Otherwise, this and a myriad of other "facepalm" issues would've been dealt with. how about messages in apps like whatsapp and telegram ? they store the messages in server and not internal memory right ? so the messages cannot be retrieved this way right ? actually whatsapp solely stores on client for telegram you have at the very least a cache which stores stuff for when you are offline and telegram secret messages are also client only. All stored locally, when displayed on screen. It depends on the application, how they scrub deleted items and whether that particular memory allocation has been written over, once freed. If there's a problem with the device encrypting flash storage data, that would be due to the Android OS and not google. This is a major security flaw on Android's part because if you're someone who saves all of your passwords via an app or text document, you're security is seriously compromised! Let's say you sell your phone on Kijiji and it just so happens that a notorious hacker buys it. They could hack it, recover all of your data and web browsing history. Even after you delete files there is always metadata left. It's like smashing them into hundreds of tiny basic pieces. Recovering it puts these pieces back together and restores the files/data. If you had a password to your bank account saved on your phone, they could recover that and all of your browsing history. They would know which bank you signed into and (with a good VPN and security) they could log in and be untraceable. Then they could remotely transfer your money to a bitcoin account and would never get caught. It's very hard to do, but some people out there can. Less experienced hackers will even sell stolen accounts to more experienced hackers. The reason that Android does this is to protect stolen phones from completely getting wiped by people who steal them. This is called Factory Reset Protection (FRP), and while it is good for protecting yoursef against thieves, it doesn't protect you against hackers. Though there is an extremely smaller chance of this happening, it still would be far more detrimental than a stolen phone. Bottom line - I think Android should offer an inexpensive service that wipes all data on your device. It's a scary world in technology these days and no one's information is uncompromisable. Ofc. 100% privacy must be a priority, but not when you have an agenda; and by "you", I mean them. I've had apps show up in permissions, after a factory data reset, even though they're not on the phone. A safe mode reset, or two (or, something) later and they've disappeared "on their own". This is a brand new, stock, unmodified, Lenovo C2 and it's ghosting me left-right-and-center. For example, the newest issue is that whenever Location is turned on it goes to High accuracy with no way to set the default back to the factory (!) GPS only option. So, who knows. We're now in the mouth of madness. The twilight zone. The thing is your mobile device is like a pc (computer) harddrive. All data that has been put on it or saved is recoverable. The only way to make sure nobody can recover anything from it is to destroy it completely smash all the internals one by one with a hammer till there's only small pieces left. Else with the right software and rebuilding the device you can recover it. No software in the world can remove it unless it's software that cause the device to overheat and burst into flames and thus destroying it in such a manner.